Note from shop owner I have waved farewell to Etsy for now, and am thriving on my website starzyia.com a site I've operated for 5 years. All Etsy orders placed before today have shipped, and I am contactable here through my Etsy shop to give you my support and guidance as usual. However if you want more Starzyia handmade goodness, you will need to visit starzyia.com all my current valid Etsy coupons including returning customer coupons will be honoured there. I thank you so much for nearly 10 years wonderful support here on Etsy. I hope I see you again, Starry. ** Are you waiting for a parcel? Australian Deliveries take ideally 4-10 business days, but can take longer, and are considered lost at the 3 week mark. International Deliveries take ideally 10-21 business days, but can take longer, and are considered lost at the 8 week mark. I have waved farewell to Etsy for now, and am thriving on my website starzyia.com a site I've operated for 5 years. The stamps are wonderful. They arrived in perfect condition. Thank you! Absolutely gorgeous collection of stamps - thanks! Starzyia is relocating to starzyia.com I hope we can count on your continuing support, you can still count on ours, contact us here any time or on our website. 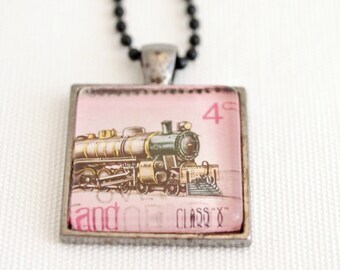 From original vintage postage stamp to ready to wear pendant! I opened Starzyia in 2009 with the aim of rehabilitating myself and gaining financial independence (earning my way off my disability pension) but what makes me jump out of bed in the morning is creating and sharing meaningful jewellery to enrich your life. Its one thing to have a favourite piece of jewellery, but when you know what it means, you can fully appreciate what it adds to your life, how it inspires you, how it heals you, and why it makes you feel the way you do when you wear or behold it. That is what I am committed to creating for you.I want you, and the people you care about to have something you can look at and hold that reminds you to be positive, think and feel great things about yourself and about life, and that is what you can find here at Starzyia, especially for you. 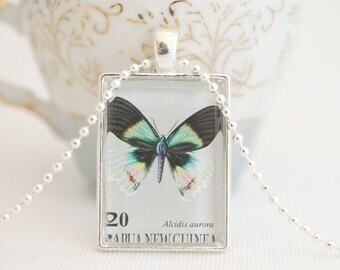 ♥ I also love to create jewellery with vintage postage stamps, I have literally thousands of postage stamps that came on letters to my grandmother from friends and family scattered across Eastern Europe for over sixty years. The news each stamp carried is a mystery, but it was deeply personal between women. It was a friendship, and a love, and not giving up on a person even though they would never see each other again in this lifetime. They felt the need to connect, to love, to care for each other, and share the highs and lows of life. And they did it letter after letter spanning decades. Each letter was part of something I consider to be an Epic Love. My creativity is driven by the underlying meaning and energy of each piece which can be symbolic or literal, through use of words. I use my original photography, graphic design, paper cutting and paper collage, and vintage postage stamps. Starzyia gift tags and postcards are printed in Australia by this company, I receive them, examine their high quality and complete the transition into swing tags myself. I then prepare each customer's order, wrap and ship them myself. My original photography is printed to archival standard. Greeting cards, tote bags and stationery all my items are in stock - I don't print to order or drop ship so I know the quality of each item and vouch for it. I have worked with this pro print company since 2012, the quality is exceptional and reliable, with the best papers, cardstock, and print finishes chosen every time. I ship your orders personally from stock on hand. Hi thanks for considering Starzyia for your meaningful, inspiring jewellery and gifts. The greatest of care is taken in creating and fulfilling your order, however if you receive the wrong item, a damaged or faulty good, or would like to return an item for refund or exchange, please do not hesitate to contact Starzyia to begin making arrangements. 1. Contact Starzyia to let us know you wish to return an item, we issue you with a Return Code, which you must mark on the outside of your parcel. 2. You must correctly address the parcel to Starzyia, we will confirm when you contact us for the return code where the item should be sent to. 3. Use tracking, this is for your protection so you can prove to your payment provider that you returned the item, that way you will get any refund or exchange that you are entitled to. 4. Returned items need to be received in original condition any loss in value from damage or use is subtracted from the value of your refund. However it is really easy to take good care of items you are returning and we don't anticipate you will have any trouble if you wrap and package your items similarly to how we did when we sent it to you. We accept all payment methods available through Etsy Payments (formerly known as Direct Checkout) including Paypal. Your payment covers the purchase of your chosen item/items and the standard shipping (unless an upgrade was chosen at checkout). If your nation/state, charges customs, import levies, VAT, or other additional costs this is not included nor will it be covered by Starzyia. Every effort is made to ship your parcel within 12-48 hours of receiving payment, however I am unable to ship on Tuesdays, this also effects Express Shipping. Allow up to 7-9 days business days for Australian domestic parcels that have not had Express upgrade applied. ~~~~ If your Australian domestic parcel has not arrived within 3 weeks, please notify me to arrange a refund or replacement parcel. Orders outside of Australia take 9-21 business days and in some cases up to 8 weeks, allow for delays. ~~~~ If your International parcel has not arrived within 8 weeks, please notify me to arrange a refund or replacement parcel. I cannot ship express parcels between my Monday morning shipping run and my Wednesday morning shipping run, Express Shipping will still help you recover from the delay between my Monday shipping run and my Wednesday shipping run. ♥ From the date that I mark an item shipped, Express Australian delivery can take between next day to 4 day delivery depending on how far you are from me (WA) and whether you are in an urban or regional centre. Always factor in delays when buying a gift. Making designs to customer specifications is no longer part of my business model, but I thank all my customers who I've previously worked with on custom orders. WHOLESALE is available for genuine retail stockists and shop consignment when suitable, please contact me for a viewing of the wholesale catalogue and terms so you can decide if Starzyia is the right fit for you. Now relax, and dream of pretty things! Your privacy is important to me. I don't personally store any of your details, I access them via Etsy to fill your order (a name and full and correct postal address to send the order to) and will communicate with you via Etsy conversations/messaging only about your current order, or in response to your request for customer service, information, or support. I never have access to your payment and financial details, Etsy only notifiy me that I have a paid order from you. Your email address, name, or telephone number are not stored in a data base by me and are not disclosed to third parties outside of Etsy. - And no one know ths actual value of the products they receive. Standard shipping for Australian orders, is oversized letter for cards and gift tags, or flat rate tracked parcel for jewellery and accessories. Delivery for this is scheduled to take up to 7-10 business days (with delays up to 3 weeks on rare occasions) Please see the next FAQ if you are interested in upgrading to Express. Express Shipping is available to Australian residents for most items, by using the shipping upgrade at checkout. *Please note I am unable to ship anything on Tuesdays, this effects Express options too, which will be sent on Monday morning or Wednesday morning onwards as soon as possible. Express Shipping is via Australia Post and can take 1-3 days, allow for 4 if you live in a regional/isolated area. ** I am unable to Express ship to International addresses. In addition to the standard estimated time for delivery, I need to allow a leeway for customs and extraordinary circumstances beyond my control. If your Australian delivery has not arrived within 3 weeks from the date of shipping I will arrange a refund or replacement. If your US or International delivery has not arrived within 8 weeks from the date of shipping I will arrange a refund or replacement. All Starzyia item prices do not include VAT and other import fees and taxes for international orders, if these costs occur they are paid by buyers directly to the collecting agency in your region. Items that meet the VAT or tax threshold in your region will not be able to be delivered to you if you are unwilling to pay what you owe by law. Unpaid taxes and levies result in items being returned to me - in this case I refund the item value but not the shipping cost, after I have received the order back. GST and State Taxes - Etsy have poorly worded their website "prices include GST if applicable" this is incorrect, Etsy will add GST to your order where necessary, the GST is calculated by the price of my store items and added at the checkout. All jewellery orders have a care card included in the parcel, please save this, its great advice that will prolong the life of all your jewellery. The essential care details are to keep all jewellery dry, and dust free. Exposure to moisture, dust, and beauty and body products including perfume, body lotions, and hairspray are the primary causes of tarnish. Ear wires can be gently wiped with soft cotton jersey when removed at the end of the day.